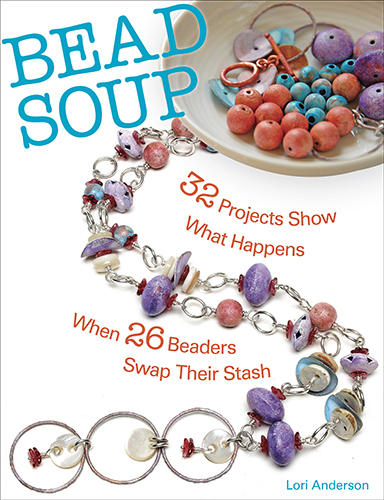 First up is Shirley Moore over at Beads and Bread. She was the first person (besides my very dear husband) to hit the little "Follow" button on the side of my blog. That nearly blew me away - someone I didn't know and had never met had actually found my blog interesting enough to want to return! Following her profile back to her blog, I found an amazing woman and a great friend. What strikes me most about Shirley is her enthusiasm and determination to try totally new techniques and make them her own. And every once in a while she shares pictures of her amazing baking. Really makes me wish we lived closer! The next three have already received Kreativ Blogger awards from other bloggers, but they're at the top of my list too. 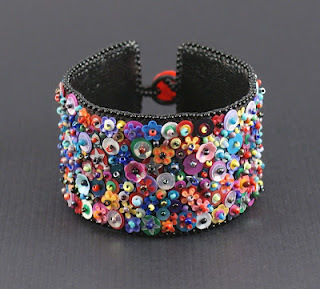 I am in awe of Sarah 'Sequin's' bead embroidery over at Saturday Sequins. She's also gotten into freeform peyote, which catches me every time, and of course, there's the sequins! Her blog truly is my regular dose of "sparkle and shine". Beyond her beading, Sarah's incredibly articulate posts about the nature of creativity - including it's pitfalls and hurdles - remind me that while I might work by myself, I'm not alone. From Bobbie's post "Packing Daggers"
Bobbie Rafferty at Beadsong Jewelry never fails to make me smile, and often makes me laugh outright with her warm humor and incredible story telling. Wonder what I'm talking about? Check out her response to receiving a Kreativ Blogger award. And I can't end a paragraph about Bobbie with out mentioning hats - big, bold, lovely, Derby hats. At least once a year, she feeds my hunger for all things millinery. Christine Altmiller's the one who gave me the Kreativ Blogger award (and handed me this challenge). Even if she hadn't, she'd definitely be on my list. Check her blog out at One Kiss Creations. Taking a swing in an entirely different direction, there's Jim Downey's blog, Communion of Dreams. As the author and co-author of two very different books (science fiction & a caregiver's memoir/guidebook for caring for family members with dementia), and a professionally trained book and document conservator, Jim brings his unique perspective to his blog, sharing candid looks into his life as a writer, craftsperson, artist and independent author. If you've ever considered self-publishing, then I highly recommend Joel's Friedlander's blog, The Book Designer. His extremely popular blog covers everything from the art and craft of book design, to publishing, marketing, promotions - you name it! His archives are an incredible resource. 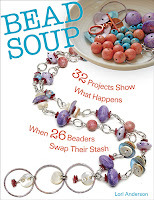 I met JJ Jacob's a little over a year ago, when we were paired for Lori Anderson's Bead Soup blog party and we've been friends ever since. Equally talented as both a painter focusing in abstract acrylics and as a glass artist, what I think I love most about her blog, Coming Abstractions, (besides the wonderful photos of her work) is her down-to-earth practicality. Last year, she left her successful business career to launch her career as an artist, using every skill, contact and strength she developed over her years in the corporate world. I am in awe of her drive and her ability to make her career a success. Since I just mentioned her above, now's a good time to name Lori Anderson. 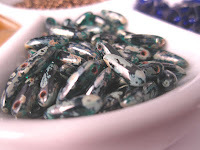 As the instigator and coordinator for the Bead Soup Challenge and Blog Parties, Lori's responsible for introducing me to more beading bloggers than anyone else I can name. Her blog, Pretty Things, has to be one of the most popular beading blogs out there, for good reason. The generosity of Lori's spirit knows no bounds. Neither does her creativity! And last on my list is Andrea Donnelly over at Little Fool: (a small business romance). I met Andrea at Penland School of Crafts back in 2008, where she took an 8-week Iron Working class. Here's a blog post from my archives with her decked out in protective gear for an Iron Pour (there's also video of the pour). 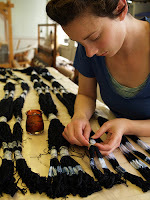 Outside of Penland, Andrea is an incredible fiber artist, dyer and weaver and her blog follows her studio and business. 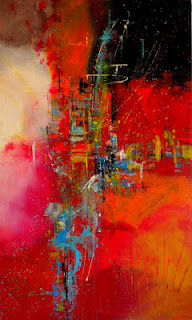 Her latest post, entitled Studio Textures, is a lush photo essay of fibers, textures and color. Christine made a wise choice when she picked your blog, you are very creative in your free form designs, I love your work. Great picks for your top ten. It is so hard to just pick 10 when there are so many deserving. These are so interesting. I will check out each of their blogs. It was really hard to limit myself to only 10 and then stick within the rules I set for myself. Oooo, I am going to check these out! I love your style so I am bound to find the goodness in these blogs too. Isn't Bobbie a talented riot?! Love visiting her blog! I love to hear about these folk who so willingly share their creative gifts. I am crawling (at a snail's pace) to the place where I'll have the courage to start my own blog, and all these inspirations are a friendly shove in the right direction. Thanks for sharing, Karen. Big cyber hugs to you! You made my day!